Nothing seems to be confirmed yet, but if true Nigeria could be in for a rough political transition. 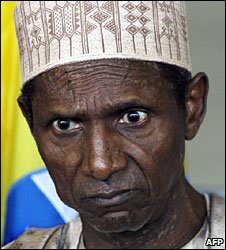 Senior members of Nigeria’s political elite will hold emergency talks on Monday after President Umaru Yar’Adua was reported to have been left “seriously brain-damaged” following medical treatment in Saudi Arabia. I’ve been away from this blog for the holidays, but now that I’m back I’m ready to start commenting on the recent news about the terrorism scare in Nigeria. Consider the clip of the BBC news report posted below. 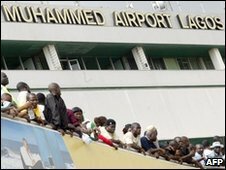 The US has singled out Nigeria for tougher airport security rules. Now this MIGHT be a reasonable policy idea. It definitely could play well with Americans now scared about flying (I just flew and I must say I am not scared at all by any of this. I’m still safer flying than driving my car.) But it could backfire in a big way in a place like Nigeria. Nigerians are clearly worried by this turn in US policy. And they rightfully sense that there is a double standard. Did we publicly ask Britain to change its airport security polices after the shoe bomber incident? No, as Nigerian information minister Dora Akunlyi mentioned in a report I heard on NPR this morning. And of course, the US has grown a number of “terrorists” of its own. So should the action of one individual impact our policy towards Nigeria? The US should be aware that these policies could backfire. According to the Pew Global Attitudes Project, 79% of Nigerians had a favorable view of the US in 2009. However, that may be largely part of an “Obama effect” as the percentage hovered in the low 60s for much of the Bush Administration years. And approval of US anti-terrorism efforts was a much lower 49% in 2006. Unfortunately, these statistics do not mention the possible differences between Muslim Nigerians and Christian Nigerians. The US could lose support among the Nigerian public. We could, indeed, foster the very conditions that lead people to turn against the US. I’m not saying this is going to happen, only that it is a concern that we should consider. The attempted bombing by Nigerian Umar Abdulmutallab was likely a random event in terms of its connection to Nigeria. Should we continue to pay attention to possible terrorist threats from Nigeria? Sure. But we should do so in a way that positively engages Nigerians, not in a way that may place them in the unsavory category of terrorist-producing states. Unfortunately, our targeting of their airport security seems to have done just that. The US is risking its ties with Nigeria by asking travellers from the country to undergo stiffer airport security, Nigeria’s information minister says. Dora Akunyili said she was disappointed with the US decision, which came after a Nigerian man was charged with trying to blow up a plane on Christmas Day. Earlier senior Nigerian officials confirmed they had officially asked the US to scrap the new rules.